The quest to explore the frontiers of physics will heat up next month in Japan, when beams of high-energy electrons are set to start smashing into their antimatter counterparts at one of the world’s premier accelerator laboratories. The experiment, called Belle II, aims to chase down rare, promising hints of new phenomena that would extend the standard model — a remarkably successful but incomplete physics theory that describes matter and forces. 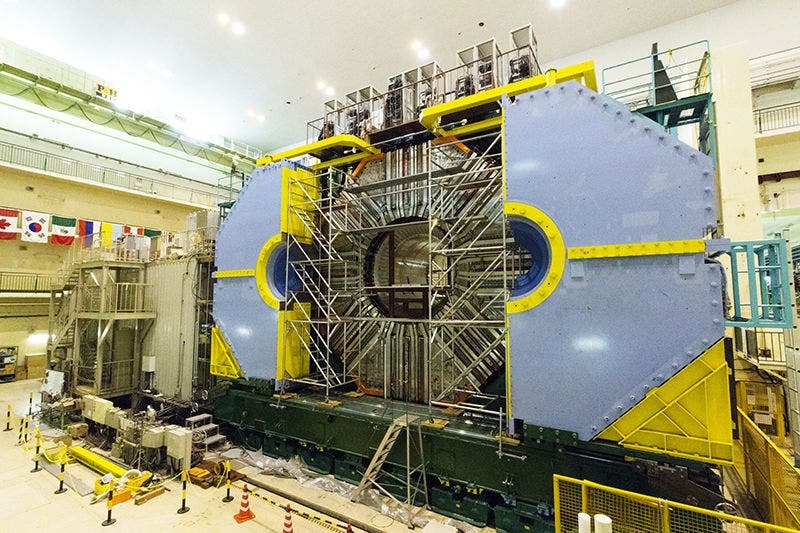 In February, writes Elizabeth Gibney in today's Nature, an accelerator at Japan's High Energy Accelerator Research Organization (KEK) in Tsukuba will begin an initial six-month run of collisions. The eventual goal is to chart in high precision the decays of B-mesons, which contain a fundamental building block of nature known as a b quark (the ‘b’ stands for ‘beauty’ or ‘bottom’). The work builds on B-meson observations made by experiments including those at the Large Hadron Collider (LHC) at CERN, Europe’s particle-physics laboratory near Geneva, Switzerland. Both efforts are looking for the subtle influence of any new particles or processes on the ways that known particles decay into others. Physicists at the LHC saw some intriguing signs of potential departures from the standard model, most recently in 20171.